Superstar attackman Lyle Thompson made a solid season debut with two goals and an assist, but the Chesapeake Bayhawks dropped a tough 15-13 loss to the Ohio Machine at Fortress Field on Saturday night. Thompson, who led the Georgia Swarm to the National Lacrosse League championship, showed he will make an impact for the Bayhawks as defenders slid to him quickly every time he had the ball. Midfielder Myles Jones scored four goals to lead Chesapeake (3-5), which has lost four straight following a three-game winning streak. A pair of rookies – attackman Josh Byrne and midfielder Jake Froccaro – both had hat tricks for the Bayhawks, who led just once during the contest. Another rookie – short stick defensive midfielder Isaiah Davis-Allen – gobbled up five ground balls and did outstanding work between the lines. Veteran attackman Matt Danowski added a goal and an assist for Chesapeake, which committed 15 turnovers. Rookie faceoff specialist Ben Williams turned in another strong effort by winning 15 of 30 draws. Niko Amato got the call in the cage and went the distance, making 15 saves. Reese was not pleased with the turnovers, many of which were unforced. “We’re making way too many stickwork errors that just should not happen with professional lacrosse players. We need to spend more time during the week working on our stick skills,” he said. Chesapeake fell behind 2-0 early, but the defense clamped down and Amato made some superb saves to spark a comeback. The Machine were held scoreless for more than 15 minutes and the Bayhawks capitalized. Jones put Chesapeake on the board with just under four minutes elapsed, faking a 2-point shot then driving left into open space and scoring on a sidearm ripper. Byrne and midfielder Matt Abbott scored unassisted goals a minute and a half apart as the Bayhawks tied the score 3-3 after one period. Abbott scooped a loose ball out front and quickly flipped an underhand shot into the net while Byrne used a shot fake to get into the heart of the defense for a left-handed shot into the top corner. Rookie midfielder Jake Froccaro gave Chesapeake its first lead 2:21 into the second quarter when he took one step inside the 2-point, dropped down and fired an absolute cannon blast into the cage to make it 4-3. Ohio responded with a 3-0 run to retake the lead at 7-4, but Byrne closed out the first half scoring by using box fakes to elude two defenders and find open space out front for another left finish – making it 7-5 at halftime. Bayhawks fans have been waiting all season to see Thompson wield his magic wand and he delivered early in the second half. Jones used a sweet swim move to beat his defender from behind, quickly changed direction and wrapped around the goal then scored on a no-look backhanded flip. However, Ohio used a 3-1 run to take a 10-6 lead with 5:56 remaining in the third stanza. 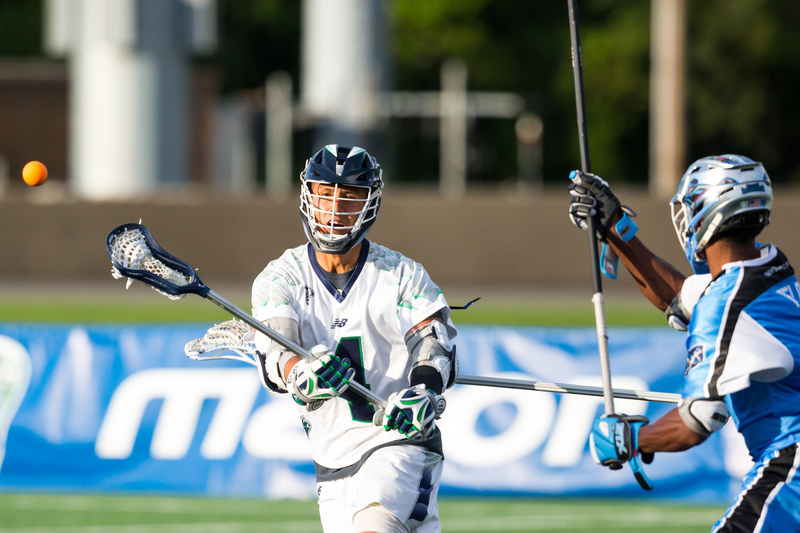 Jones ended a nearly six-minute drought for the Bayhawks by bulling his way in between two defenders, spinning and unleashing an overhand shot from five yards away. The Machine tacked on another goal to take an 11-7 lead into the final frame. Chesapeake scored three goals in the opening four minutes of the fourth quarter to get back within one. Froccaro drove from behind to goal-line extended then wrapped a shot around the back of defenseman Jackson Place. Less than a minute later, Thompson used a lightning-quick inside roll to score unassisted. Long stick midfielder C.J. Costabile then made a brilliant play, scooping a ground ball near the cage and firing an overhand shot just inside the low pipe. The ball ricocheted into the field of play, but a replay review requested by Reese showed it was indeed a goal. Ohio scored to briefly halt the Chesapeake charge, but Froccaro and Byrne scored 43 seconds apart to forge a 12-12 tie. Froccaro finished from eight yards out front off a great look by Danowski while Byrne stuck a lefty sidearm shot after taking a dish from Jones. The Bayhawks then went more than six minutes without a goal and that allowed the Machine to retake the lead at 14-12. Danowski ended that drought with a beautiful behind-the-back goal that he bounced past Kyle Bernlohr. Rookie attackman Colin Heacock spotted Danowski cutting to the crease and made a superb pass inside. Ohio was awarded possession after it was ruled that Chesapeake committed a loose-ball push during a wild scramble off the ensuing faceoff. It appeared to be a bad call as it was Williams, the Bayhawks’ faceoff man, who got shoved to the ground. Cannizzaro then scored the clinching goal for Ohio, making it 15-13 with 2:07 to go. Chesapeake had two good chances to cut the deficit to one during its next possession, but Froccaro’s crank shot was just wide while Bernlohr stuffed Thompson, who had made a spectacular move to get to the front of the net. Thompson dove over the goal line while shooting and was called for a crease violation with just under a minute remaining. The Bayhawks play next at home on Sunday, July 2nd at 6:00pm vs the Rochester Rattlers at Navy-Marine Corps Memorial Stadium in Annapolis. The July 2nd game marks the Bayhawks’ Hometown Hero and Military Appreciation Night which will feature a country concert featuring Nashville star Craig Campbell and a post-game fireworks show. For tickets, please visit thebayhawks.com, call 866-99-HAWKS or email sales@thebayhawks.com.